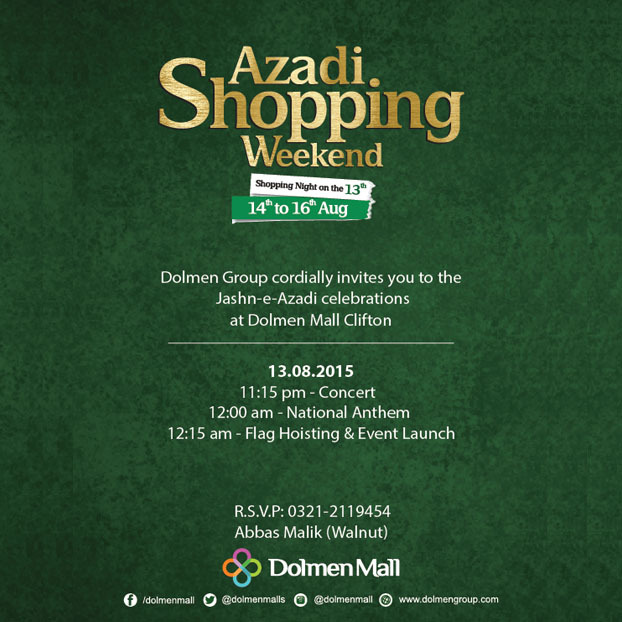 Dolmen Mall celebrates 68 glorious years of our beautiful country with fun filled activities starting tonight from 10:30pm onwards. Come by with your families and enjoy a midnight parade, and live performance of our National Anthem by Ali Azmat with a flag-hoisting ceremony. The Dolmen Mall team invites you to show your love and join in the Jashn-e-Azadi Celebrations by tweeting about your love for Pakistan or posting on Instagram a photo of what you love most about Pakistan, using the hashtag #GoGreenPakistan!! PKDL Showcasing at the APPNA Convention August 13th-16th! L'atelier Annual Sale upto 75% Off & New Designer Collections in Store! LABELS AND BONANZA LAUNCH THE 'SHOP-IN-STORE' CONCEPT! Kiran Fine Jewellery to Showcase at Faisana Diwali Pop Up Shop London!